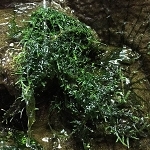 A ideal foreground plant in the terrarium as it only grows 4-6" tall. Slowly spreading rhizomes eventually form a mat of the nearly black leaves that will contrast other plants nicely. Tolerates high levels of moisture so works equally well as a marginal plant, too! Available plants are growing in 2" deep pots.